Empire Park dream big and don’t act in half measure. Their roots are in Hobart. Festival season set this Southernmost capital alight, but most of the time it seems quiet. There’s something about Tasmanian culture which assumes a certain sense of isolation and melancholy. Yet this hasn’t blunted this group’s edge. Empire Park wrap adversity around themselves and cast it as narrative. The band are currently based in Melbourne but an impression strikes that they were reaching for this arena-ready sound even while coming of age. Music for wide open spaces from a city which struggles to fill its own. On Nobody’s Watching Me you can hear the ambition. There’s alternative and heavy undercurrents but equally ‘80s melody. It would be easy to place these five beside Gang of Youths. But there’s also an element of Springsteen pre-‘Born In The U.S.A.’ A hint of that same working-class universality. Hope with a darkness at its edge. But whatever rock’s jealously guarded borders this southern outfit seems little beholden. ‘Nobody’s Watching Me’ plays out along its own vibration. A sense of freedom, possibility and a near blinding self-belief permeates. It pushes them forward. Opener ‘Look Up’ sprawls skyward. Soundscaping riffs circle amidst dark vocals. There’s plenty of polish but just as much emotional gut punch. Ballads like ‘Wandering’ give contrast. They strip back to deliver flat-out emotional moments. Here vocalist Harrison Manton wanders into the rich vocal gravitas not too far from The National’s Matt Berninger. He hangs his thoughts around sombre sonics and monumental builds. Title track ‘Nobody’s Watching Me’ falls last, closing as a fractured soliloquy. This EP presents a group arriving more or less fully formed and embodies the excitement of a live performance set to record. There’s a bleakness tinting this outfit’s sound but, despite the chill, their message is positive. In fact, it’s inescapably uplifting. Young bands like Empire Park seem possessed with a new idealism. They didn’t read the liner notes. They’re not chained to rock’s ‘work your way up from the boondocks’ ethos nor indie’s dogmatic tenants. They’ve witnessed a glorious after burst of alternative rock and wanted it for themselves. 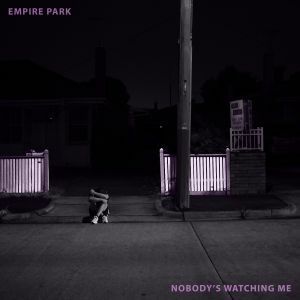 With homegrown successes like Gang of Youths and DMA’s crafting sounds to fill big spaces and riding a new Australian vanguard into the UK, acts like Empire Park are an inevitability. They’ve been given a promise in which to believe. But can they surpass it? ‘Nobody’s Watching Me’ is out this Friday May 18th.